Jamz has over 100 designs now (from tribal & southwest, to flames & skulls, to Emo, leopard spots, flowers, & action heros…). Truly something for everyone. $35.00 Value. Open to US and International folks. 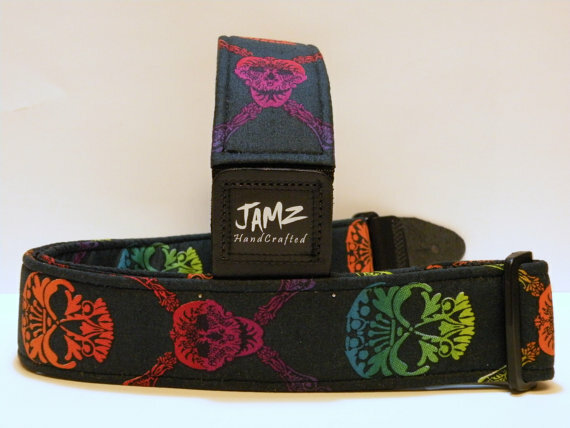 To win ONE Jamz Guitar strap- just leave a comment here on this blog post. Which one will you pick?! To double your odds, go to my Facebook page & click “like”. I post music, pics & vids there. Come back here & post to let me know. To triple your chances of winning- go to Jamz Originals Facebook page & click “like”. Come back here & post. Jamz has pics of the newest straps on Fb. This 2012 Post is closed for comments. Those are great! I would love one! I need a strap because I can’t sit down. Really! I love them all especially flames,skulls,& leopard spots . My old strap just gave out while I was playing, I was lucky to catch it or else it would have broke, I hope I get it! I could always use a free strap! I LOVE the argyle straps! this a really cool contest. I especially like that you have superhero straps. I liked your page and Jamz page and if I win I want the blue flame strap!!!! Happy Easter, Tara!! !I really need a Jamz Guitar strap, they are the best!! !I hope I can win, fingers crossed!!! Great stuff! Definitely something to have! Tara, I liked your Facebook page & Jamz Facebook page. Now I have tripled my chances of winning the Jamz Guitar strap!! !You & Jamz are the best!!! liked both your page and the jamz page! Just seen your videos, love your music! Good luck! I would love to win one of these excellent straps! I ‘liked’ you on FB! Ah! So many cool ones to choose one, but I reckon I’d go for the Voodoo black skull barbed wire one, it’s pretty cool. I I also “liked” both those facebook pages. Love your straps, wish I had one!! I like the blue flames. Hmmm. How can I get 4 of these beauties? I’m a big fan of Jamz. I’m especially fond of the voodo skull strap in the picture above! Ive gotta say I love them all but I really like the BLACK MAGIC – Blue Flames strap! Gorgeous straps! I’d love to have any one of them. I really like the MARINER COMPASS design strap – beautiful! 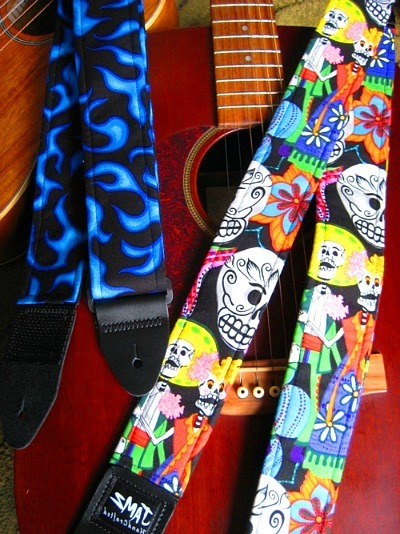 Very cool straps – I like the one with the purple guitars (middle one on the 2nd pic) a lot..
Heh…a Jamz guitar strap would brighten up one of my instruments, certainly. Liked your FB page too, for good measure. Nice straps! I like the one called Midnight Blue…. they look awesome! do want! I want the “KOKOPELLI” … it’s epic!! Awesome! Dia de los Muertos strap for me! I would pick the skull one. Awesome awesome awesome! I love colors. Designs. Guitar straps. Jamz. Good stuff, totally with the polka dots. You can never have too many staps! You can never have too many straps! I liked both pages as Steve Slammins. The argle straps are just perfect! Would love to win one!! Sorry meant argyle…love them still! I love the skulls or the Aboriginal artwork one is really great. But they are all wonderful and I’d be happy with any of them. I really love the skulls and the Aboriginal Artwork one. I would be so happy with any of them though. I love the Vertigo strap! Too many choices…make me have to choose!